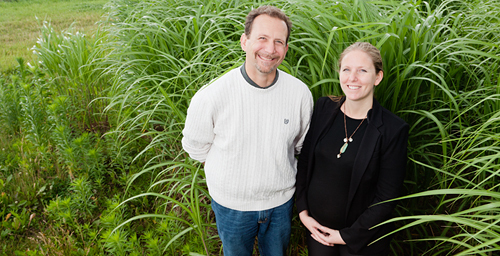 University of Illinois plant biology and Energy Biosciences Institute professor Evan DeLucia, EBI feedstock analyst Sarah Davis and their colleagues found that replacing the least productive corn acres with miscanthus would boost both corn and biofuel production. CHAMPAIGN, Ill. - Growing perennial grasses on the least productive farmland now used for corn ethanol production in the U.S. would result in higher overall corn yields, more ethanol output per acre and better groundwater quality, researchers report in a new study. The switch would also slash emissions of two potent greenhouse gases: carbon dioxide and nitrous oxide. Experimental plots in Urbana, Illinois, grow corn, switchgrass and miscanthus in side-by-side trials. The study used a computer model of plant growth and soil chemistry to compare the ecological effects of growing corn (Zea mays L.); miscanthus (Miscanthus x giganteus), a sterile hybrid grass used in bioenergy production in Western Europe; and switchgrass (Panicum virgatum L.), which is native to the U.S. The analysis found that switching 30 percent of the least productive corn acres to miscanthus offered the most ecological advantages. "If cellulosic feedstocks (such as miscanthus) were planted on cropland that is currently used for ethanol production in the U.S., we could achieve more ethanol (82 percent more) and grain for food (4 percent more), while reducing nitrogen leaching (by 15 to 22 percent) and greenhouse gas emissions (by 29 percent to 473 percent)," the researchers wrote in their report, published in the journal Frontiers in Ecology and the Environment. "Globally, agriculture contributes about 14 percent of the greenhouse gases that are causing global warming to the atmosphere," said University of Illinois plant biology and Energy Biosciences Institute professor Evan DeLucia, who led the study with EBI feedstock analyst Sarah Davis. "The whole Midwest has been, since the advent of modern agriculture, a source of greenhouse gases to the atmosphere." "According to our model, just by making this replacement you convert that whole area from a source of greenhouse gases to the atmosphere to a sink for greenhouse gases from the atmosphere," DeLucia said. 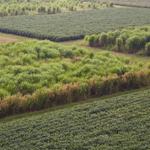 Miscanthus grows in thick stands up to 13 feet tall in test plots in Illinois. It does well on marginal land without being fertilized, so using it as a biofuel feedstock instead of corn would eliminate a major source of air and water pollution, Davis said. Nitrous oxide, a byproduct of the fertilizers used on cornfields, "is actually a more potent greenhouse gas than carbon dioxide," she said. "Both switchgrass and miscanthus are perennial grasses, which means that you don't have to till every year, you don't have to plant every year, so there's much less soil disturbance happening than with corn," Davis said. "And because the root system remains in place year after year, there's more carbon going into the soil." Several hurdles remain before the transition from corn to cellulosic ethanol production can occur on a commercial scale, the researchers said. Converting the sugars in corn to ethanol is easier than releasing the energy locked in plant stems and leaves. Currently, one commercial-scale lignocellulose biorefinery is under construction in the U.S. - in Florida, the researchers said, and other facilities are in the planning stages. More research must be done to increase the efficiency of the process, the researchers said. "We know that these grasses are enormously productive; we know the agronomy works; we know the ecology works," DeLucia said. "So the next step is to break down the economic barriers by making an efficient conversion chain from lignocellulosics to ethanol." DeLucia said most scientists in the field expect this to be achieved within a decade. DeLucia is an affiliate of the Institute for Genomic Biology at Illinois. The BP-funded Energy Biosciences Institute funded this study. Editor's note: To contact Evan DeLucia, call 217-333-6177; email delucia@illinois.edu. The paper, “Impact of Second-Generation Biofuel Agriculture on Greenhouse Gas Emissions in the Corn-Growing Regions of the U.S.,” is available from the U. of I. News Bureau.